We will keep this page updated to show you all the things we do with your personal data. This policy applies if you are a member of the Moorcroft Club, visit our shops, visit our website, email, call or write to us. In this policy, whenever you see the words ‘we’, ‘us’, ‘our’, ‘Moorcroft’, ‘Moorcroft Club’, ‘Collectors Club’, ‘Design Consort’ it refers to W Moorcroft Holdings Limited and its wholly owned subsidiary W Moorcroft Limited. We collect personal data in connection with specific activities such as registration to use our websites, membership requests, placing an order, or registration for an event, etc. You can give us your personal data by filling in applications, by registering to use our websites, entering a competition or by corresponding with us (by phone, email, social media, post or by joining as a member/customer). This personal data you give us may include name, title, address, date of birth, age, gender, country, email address, telephone numbers, bank details, photographs, usernames and passwords. Our shops and sites have Closed Circuit Television (CCTV) and you may be recorded when you visit them. Please note that certain services on our website will not be available to you until you have registered to use our website. Your activities and involvement with us will result in personal data being created. This could include products you have purchased, payment methods, billing address, delivery address, details of competitions you have entered, details of events you have attended, participation in promotions. We also operate CCTV at all of our sites in which you may be recorded when you visit them. We perform analysis on the information we hold, which can in turn generate personal data. For example, by analysing your address we may send you details of events we are holding or attending near to you, which may be of interest. Our online payment solutions are carried out using a third party 'payment gateway' (e.g. Sagepay) which is a direct connection to a payment service provided by a bank. This means that when you input card data into the payment page, you are communicating directly with the bank and the bank passes your payment to us, this means that your payment card information is handled by the bank and not processed or held by us. We may also obtain a fraud risk score from our ‘payment gateway’ provider which enables us to manage and identify any high risk fraudulent transactions. Moorcroft does not store any credit card information. We will only use your personal data on relevant lawful grounds as permitted by the EU General Data Protection Regulation (GDPR) (from 25 May 2018)/UK Data Protection Act and Privacy of Electronic Communication Regulation. For the purpose of the GDPR, W Moorcroft Ltd of Sandbach Road, Burslem, Stoke-on-Trent, ST6 2DQ will be the ‘controller’ of all personal data we hold about you. Your personal data may be collected and used to help us to communicate with you concerning new event and new product releases, membership renewals, special promotions or to complete your order. Below are the main uses of your data which depend on the nature of our relationship with you and how you interact with our various services, websites and activities. 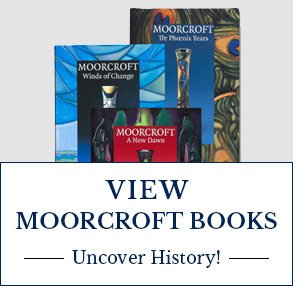 By joining the Moorcroft Club, you have chosen to hear from us about Moorcroft generally, information of forthcoming events, new product releases, memberships and special promotions. We may also from time to time send you details of connected parties, for example, but not limited to RSPB, RHS, or authorised Moorcroft retailers special events. Non-club Members who want to receive information about Moorcroft generally, or hear about forthcoming events, new product releases, memberships and special promotions, will have to formally consent to receiving this information before we will be able to start sending this to you. We will never share your information with companies outside Moorcroft for inclusion in their marketing. If you agree to receive marketing information from us you can change your mind at a later date (see Updating Marketing Preferences below). However, if you tell us you do not want to receive marketing communications, then you may not hear about events, new product releases or promotions that may be of interest to you. Note: You can cancel your membership mailings at any point (see Updating Data and Marketing Preferences below), however your membership fee will not be refunded, and until the expiry of your membership we are still required to advise you of any changes to your membership. We use the personal data you provide as a member to service your membership. This includes sending renewal information to annual members by mail and email, sending Club Journals, membership cards, Club Gift vouchers, Annual Catalogues, notification of events, notification of new product releases. We are required to provide these forms of communication under our contractual requirements with you. We will also use your personal data to provide notification of articles of interest relating to Moorcroft, special promotions, discount schemes, discounts and offer information to ensure you are aware of matters we believe that are of interest to you. Your personal data will be used to verify you when you register on the www.moorcroft.com or www.designconsort.com web sites and when you use your club membership card at a Moorcroft shop or event. We may also record purchases made by members via the Moorcroft shops, websites and Moorcroft Club. We process customer data in order to fulfil retail activities and our contractual obligations. Your data will be used to communicate with you throughout the process, including to confirm we have received your order and payment, to confirm dispatch, to clarify where we might need more detail to fulfil an order, or to resolve issues that might arise with your order. We may also hold dietary and disability requirements for events. 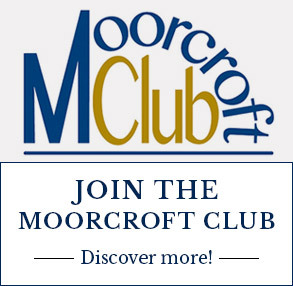 We use photographs, interviews and videos of Members and visitors attending Moorcroft events for the purpose of promoting Moorcroft and informing Club members of matters of interest via the Club Journal, websites and social media pages. CCTV is used to provide security and protect both our members and visitors and Moorcroft. CCTV will only be viewed when necessary (e.g. to detect or prevent crime) and footage is stored for set period of time after which it is recorded over. Moorcroft complies with the Information Commissioner’s Office CCTV Code of Practice and we put up notices so you know when CCTV is used. We operate CCTV at all our sites to fulfil our legal requirement to provided security and protection for staff, members and visitors. To do this we will analyse how you interact with us (e.g. on our website, what events you attend) and use geographic information to let you know what’s happening in your local area. We use specific tools to profile how you interact with us online, for example, Google Analytics. We collect information on the use of the Moorcroft website. Most of the information we collect is aggregated, however we may also collect some personal data for the use of personalising your experience, and to ensure the site is functioning as intended. The personal information that is collected includes transactional information (i.e. order details) for Memberships, and Online Shop Purchases. We also collect data on individual user activity when they create or log into their Moorcroft online account. If you have agreed that we can contact you for marketing purposes, we will use your contact details for communication purposes based on the methods of communication you have selected. We will review your personal data every year to establish whether we are still entitled to process it. If we decide that we are not entitled to do so, we will stop processing your personal data except we may retain your personal data in an archived form in order to be able to comply with legal obligations. We may also retain your personal data for the duration of any period necessary to establish, exercise or defend any legal rights. If you have created an account on any of our websites your personal data will be retained until such time as you either terminate the account, or request that your data be deleted. To ensure that you receive news, offers and other information of interest to you, you may be asked to update your consent to receive the information every 12 months. Moorcroft operations are based in the UK and we store all of our data within the European Union (EU). When we allow third parties acting on behalf of Moorcroft to access to your information, we will always have complete control of what they see, how long they see it for and what they are allowed to do with it. We do not sell or share your personal information for other organisations to use. These authorised third parties are not permitted to use your personal data for any other purposes than those described in this Privacy notice and they are required to keep your personal data strictly confidential. Information system and data security is imperative to us to ensure that we are keeping our customers, members and employees safe. We have implemented generally accepted standards of technology and operational security in order to protect personal data from loss, misuse, or unauthorised alteration or destruction. Only certain approved personnel are permitted to access your data. All personnel from Moorcroft or from authorised third parties who are granted access to personal data are required to keep such data confidential. We maintain a variety of physical, electronic and procedural safeguards to protect your personal data. We operate a thorough process for assessing, managing and protecting our systems which ensures that they are up to date and secure against the ever-changing threat landscape. Moorcroft has an active PCI-DSS compliance programme in place. This is the international standard for safe card payment processes. As part of our compliance to this very stringent standard, we ensure that our IT systems do not directly collect or store payment card information; for example, the full 16 digit number on the front of the card or the security code on the back. Please note that where you are transmitting information to us over the internet this can never be guaranteed to be 100% secure. If you have an online user account, you can amend or edit your personal data or marketing preference directly on the website. 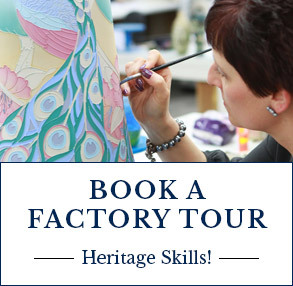 Email: enquiries@moorcroft.com with your full name, full address and Club member number (if applicable). 01782 820 500. Open 9.30am - 4.30pm weekdays. Where Moorcroft is using your personal data on the basis of consent, you have the right to withdraw that consent at any time. You also have the right to ask the Moorcroft to stop using your personal data for direct marketing purposes. You can tell us by contacting us using the details above. If you do so, we will update our records, and will not send you further direct marketing, but we may continue to contact you to the extent necessary for the purpose of fulfilling any outstanding contractual obligations. You may choose not to provide your personal data to us. However, it should be noted that some features of our website and other services may not be fully available to you if you choose not to provide us with your personal data (e.g. we may not be able to process your orders without the necessary information). to request the erasure, or restriction on the processing of your data. We will investigate your request, before deciding what action to take. Cookies are small text files placed on your computer when you visit websites to collect standard internet log information and visitor behaviour information. This information is used to track visitor use of the website and to compile statistical reports on website activity. We use first party cookies (cookies that we have set, that can only be read by our website) to personalise your online experience.